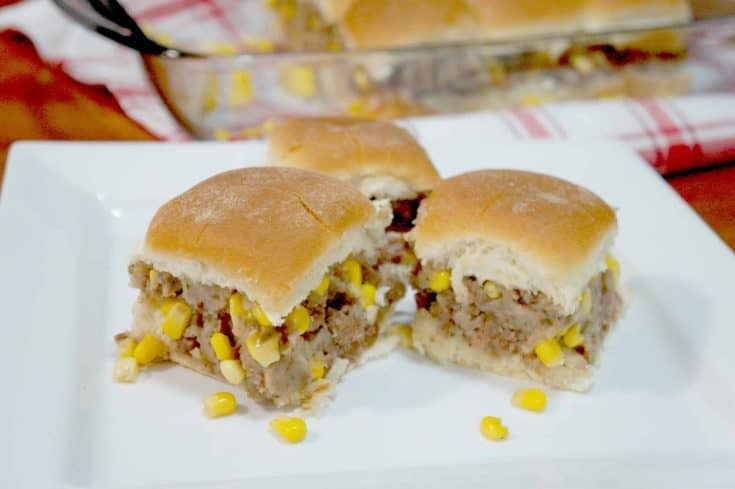 These Shepherd’s Pie Sliders work great as an easy weeknight dinner or as a party snack. They are so simple to make and taste delicious. Shepherd’s pie is my husband’s favourite dish but personally I find it a little boring. Last night for supper I decided to give new life to the classic dish. I used the traditional shepherd’s pie ingredients as filling for sliders. I was a little worried about how this recipe would turn out but they were AMAZING! I love sliders because they can be a meal or a snack. They are great for entertaining. Plus there’s just something really adorable about mini sandwiches. Still, trying to turn shepherd’s pie into a mini sandwich was risky. I started by browning some ground beef and pork.. While it was cooking I prepared some instant mashed potatoes. I combined the mashed potatoes with the browned meat and stirred in some canned corn. I also stirred in some powdered beef gravy mix for extra flavour. I spread the mixture on some dinner rolls and baked them in the oven until the buns were nicely toasted. They taste just like shepherd’s pie but in a convenient mini sandwich form. The filling is juicy and bursting with flavour. 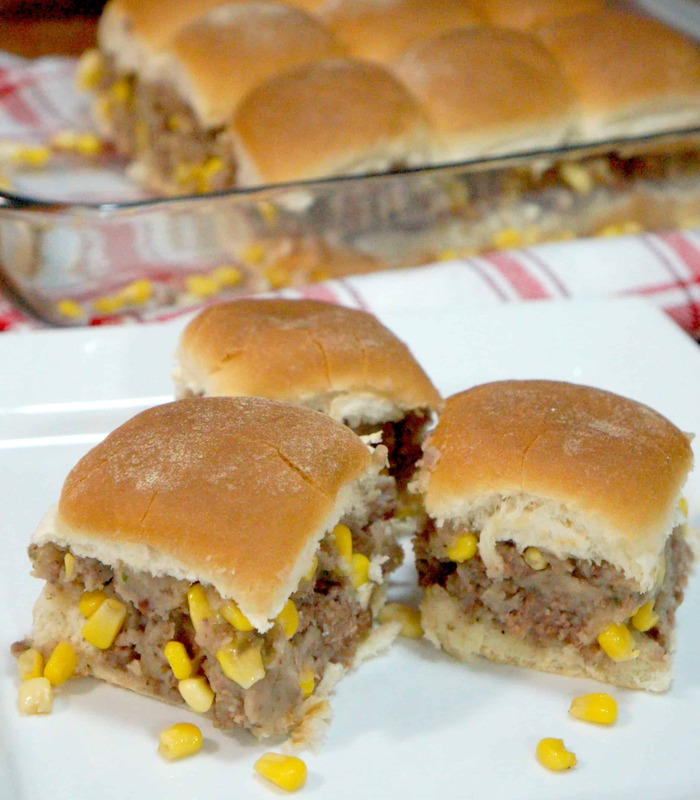 These sliders are perfect for an easy dinner or as a party snack. 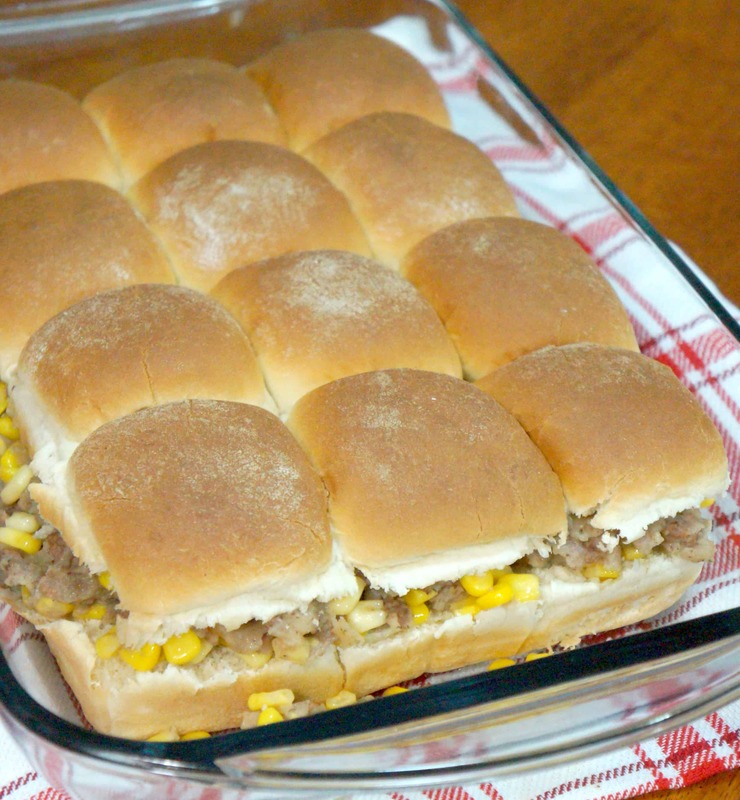 Be sure to try these Shepherd’s Pie Sliders next time you are entertaining! If you are looking for more easy dinner ideas check out Loaded Potato Meatloaf Casserole, Cajun Chicken and Biscuits Casserole and Cheeseburger Casserole. If you are looking for more party food ideas check out Bacon and Onion Dip, Sweet Chili BBQ Chicken Sliders and Chocolate Peanut Butter Cheesecake Dip. Bring water and milk to a boil in medium saucepan. Brown the ground beef and pork mixture in a large frying pan on med-high. Once the water and milk are boiling remove from heat and stir in the pouch of potato. When the meat is completely browned and the corn, gravy mix, onion powder, salt and pepper to the frying pan and continue cooking for a couple minutes. Turn heat down to medium- low and add the mashed potato to the frying pan. Slice dinner rolls in half and place bottoms in a 9x13 inch pan. Spread the shepherd's pie mixture evenly over the buns and then cover with the tops of the rolls. Place in oven for 5-6 minutes.